The Apple Tree invites you to spend an original and fun summer by way of our thematic week experience, full of stories and characters which allow us to enter different fantasy worlds along with Robin (protagonist of our English Bilingual Plan). To enjoy these days we carry out different activities in English and in Spanish which are divided into different areas and then worked globally. 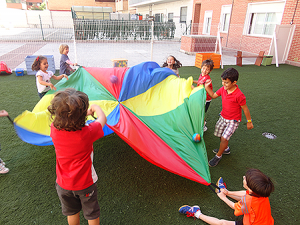 Psychomotor Activity (psicomotricidad): Games are carried out in which children can run, jump and do a series of activities which allow them an ideal interaction and teamwork. Theatre Workshop (taller de teatro): Our educationalist team has created a series of representations adapted to the ages of the group. The main objective consists in giving them the opportunity to be in someone else’s shoes and to live intrepid adventures which encourage their creativity and constructive learning. Story Time (la hora del cuento): We believe that the use of stories is essential to learn a language as it offers a fun and entertaining way of learning different structures, sounds and vocabulary. Arts and Craft (plástica, manualidades): Fine psychomotor activity, fancy dress, collage, moulding with clay, masks… everything related to the thematic week. Cooking Time (aprendiendo a ser chefs): We have created a Cookery Workshop which will help children to experiment with food, taste new flavours and discover that cookery is fun. 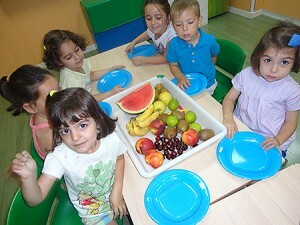 Children will follow healthy, stimulant recipes. Singing & Dancing (cantando y bailando): Creating songs and dances according to the theme of the week, intercultural dances, dancing with hankies, summer songs. Elevenses (almuerzo): Elevenses and the afternoon snack consists of the following: Fruit juice, milkshakes, buns and rolls, croissants, biscuits, fruit (pear, apple, banana), cereals, yoghurt, cheese triangles, pâté, chocolate spread. Gardening time (jardín y huerto urbano): Planting in season vegetables which we will take care of by watering them and watching them grow. Smart board (pizarra digital): Interactive activities through PDI which encourage creativity and discovery of the planned thematic weeks. 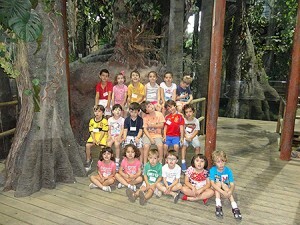 Outdoor walks (excursiones): Our walks in the city, weekly excursions to the swimming pool, to the park, the theatre, and…. Many more surprises. 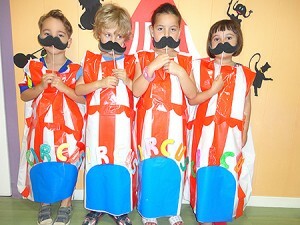 Friday’s Party (Viernes fiesta): Fun day where we wear fancy dress and celebrate birthdays and thematic holidays.